Home » Roger! Mayday! Pan-pan! What is Aviation English? Communication between pilots is essential – here enters Aviation English. American Airline flight 965 crash, December 20, 1995. Collision between a Saudi Arabian Airlines Boeing 747 and an Air Kazakhstan Ilyushin Il-76, November 12, 1996. Avianca Flight 52 crash, January 25, 1990. What did all these accidents have in common? The airplane pilots and ATCOs (Air Traffic Control Officers) were unable to understand each other. Not all of the pilots were English speakers. To improve airplane travel safety and prevent accidents, The International Civil Aviation Organization (ICAO) set English Language Proficiency requirements, applicable to both native English speakers and English as second or foreign language speakers, to ensure that pilots and traffic controllers are able to understand each other. In addition, many airline companies demand some level English proficiency from their flight specialists including a passing grade on language tests such as the International English Language Testing System (IELTS™), the Test of English for International Communication (TOEIC®) or the Test of English as a Foreign Language (TOEFL®). Deadhead: member of the crew travelling in a passenger seat, usually off-duty. Standby: “please wait”, generally used when the pilot or controller is unable to take a message at that moment. Mayday: from the French ‘m’aidez’ (help me), it’s a distress call for life-threatening emergencies, such as engine failure. Pan-pan: from the French ‘panne’, it’s a lighter version of mayday, used for serious but no life-threatening situations. Wilco: abbreviation of “will comply”, meaning that the pilot or controller received the message and will comply. If you dream of working as a pilot or an air traffic controller, you must master Aviation English and the International Phonetic Alphabet. But, before that, remember to work on your English language skills! Wayman Aviation Academy in Miami requires ICAO Level-4 (Operational) for its Flight Training Programs, which includes Professional, Private and Commercial Pilot Training, Instrument Rating, Multi-Engine, and Foreign License Validation to acquire an American FAA Certification based on the student’s foreign certification. Wayman has been training professional pilots in the USA for 30 years. 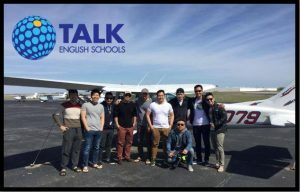 TALK English Schools can help you to improve your English and fly higher! We offer General English, Intensive English and TOEFL® iBT Exam Preparation. And more: TALK English Schools use Aviation English textbooks to help you communicate in the flight deck! 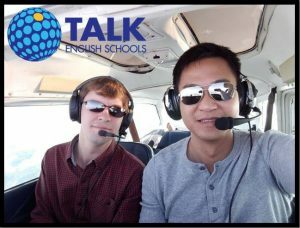 Contact us now, learn Aviation English at TALK English Schools and start your aviation career!